OCEANFRONT UNIT right on the beach! Pick the week--any time between 8/1/11 through 12/31/11. (Excluding Christmas week). Ocean front one bedroom for the ENTIRE WEEK at top rated Morritt's Tortuga Club (on the east end of the island, away from the maddening crowds and traffic!) Fully furnished one bedroom apartment with sleeper sofa--sleeps four total. On-site water sports include sailboats, wind-surfing, wave runners and kayaks, along with a world class dive operation with it's own diving gear, fleet of boats, and PADI certification by certified dive-masters. Snorkeling right from the beach too! Three swimming pools (with swim up bar), Jacuzzi, three restaurants, bar, spa and gift shop and Internet cafe--all on-site. Rental Policy: Half down at time of reservation, balance 30 days prior to stay. Cashier's check, money order. 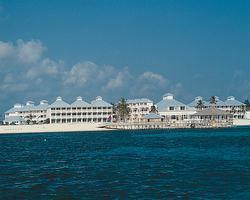 Morritt's Tortuga Club offers you a beachside vacation home on beautiful Grand Cayman Island. Relax on the silky sand or by the pool, then dive into the crystalline offshore waters, where you can enjoy aquatic pastimes. The undersea world is filled with spectacular coral and other marine life-see it on a submarine tour or during a scuba dive. The resort offers a complete diving, snorkeling, and windsurfing program plus an array of activities and nightly entertainment. David's, the on-site restaurant, provides international and island cuisine. A gift shop is also on site.